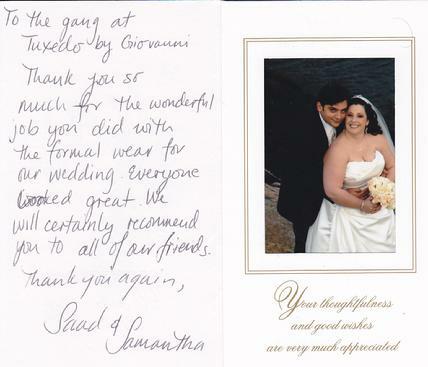 At TUXEDO BY GIOVANNI, nothing makes us happier than to receive letters from our clients telling us how special we helped to make their most important day. Our Committment to Excellence is evident in the number of thank you letters we receive from our customers. We invite you to browse through some of the comments our guests have made, and hopefully we'll be able to add your letter to our collection in the near future! Click on the thumbnails below to view our thank you notes. Enjoy! We look forward to making you just as happy on your special day! Best Wishes and Come Visit Us and Experience our Committment To Excellence. ©1997-2019 Tuxedo by Giovanni,Ltd. All Rights Reserved. "One Stop Shop For The Well Dressed Man"
"Visit Our Shop And Experience The Perfect Fit!